With Fletcher Cox leading the way, the Philadelphia Eagles’ defensive front has a big task against Tom Brady, Bill Belichick and the New England Patriots in Super Bowl LII. For the Eagles, it starts up front. They had more salary cap dollars devoted to their defensive and offensive lines – approximately $71 million – than any other NFL team in 2017. That number will likely change in a few years when Carson Wentz is on his second contract, but the Eagles have long built from the lines out. The investment has clearly paid off. The Eagles have dominated on both sides in the playoffs. If they are to topple the Patriots in Super Bowl LII, they will win need to win in the trenches. I'll get to the offensive line in a later post, but first is Jim Schwartz's defensive front, which can go as deep as nine without missing a beat. Patriots coach Bill Belichick: It's a lot more than four. I wish it was just four. Yeah, it's about eight, nine. It's a very disruptive group. They're hard to run against, hard to throw against. They're well coached, very instinctive. The Eagles will face their greatest offensive test this season – New England was the NFL's No. 1 offense in yards and No. 2 in points during the regular season — and the daunting task of containing Tom Brady in the Super Bowl. He isn't invincible. He's lost twice in the title game. He's had bad stretches in even the victories. Like most quarterbacks, when he has struggled, it was because he was pressured by the rush. The New York Giants had the most success getting after Brady and were rewarded with two Super Bowl victories. The Eagles understand the challenge that awaits them, but the d-line also realizes it likely holds the key to winning. Eagles defensive tackle Fletcher Cox: My message [to the other linemen] … was, 'Hey, guys, if we're going to win this game, we got to be disciplined in our rushes. We got to stop the run.' We can't go out and let them bake pizzas back there. If we do than it's going to be a long day for the back end. A year ago, just after he joined the Eagles, Schwartz was asked to explain his scheme. "You attack in levels," he said. It was a simple, yet great, explanation for how his aggressive defense works. Schwartz wants his linemen to pin their ears back and penetrate because he believes it's the best way to get to the quarterback. While that may at times come at the expense of stopping the run, it shouldn't if the linemen disrupt in the backfield. Sometimes that may be penetrating through a gap – hence the "one-gap" nomenclature — sometimes it may be powering a blocker back. Even if the linemen don't make a tackle, the next level of linebackers should be playing off their leverage. And if the linebackers can't make stops, the next wave of defensive backs should be there to clean up. Eagles safety Malcolm Jenkins: We got guys up front that are always attacking. … Guys that are up the field and are disruptive. They're penetrators. And then you got Nigel Bradham, Mychal Kendricks – free-flowing linebackers that know how to track blockers and get downhill. And then you got myself, Corey Graham, Rodney McLeod and corners on the back end that can clean it up and close those distances fast. On the above run, Brandon Graham shot into the backfield. He only laid a hand on the running back, but he slowed him some and forced him outside. Jenkins and Jalen Mills – in this case – were next. Neither had great leverage, but they, too, got hands on the runner until the hustling Cox and Vinny Curry ran him down from behind. Devonta Freeman ran hard. He shook off three arm tackles. It may have seemed as if he picked up chunk yards, but he gained just three. Here's Curry getting upfield, forcing Tevin Coleman to take a roundabout turn and Bradham cleaning up for a loss. And Tim Jernigan walking a Vikings center back on skates, which forced the running back to alter his route into the arms of the unblocked Mills. Most linemen would rather attack than read and react. But there must be some discipline. On this 10-yard rush, defensive end Derek Barnett took an aggressive path. What Barnett did wasn't necessarily wrong. He forced the running back to change directions. But if he wasn't going to set the edge, Jenkins or cornerback Ronald Darby needed to contain and they couldn't. Eagles defensive end Chris Long: At the end of the day, you got keys and you got to play them. We play aggressive, we try to play two, three yards deep in the backfield, it's part of what we do, but we still got to play the run. With the talent they have up front, the Eagles' attacking, swarming run scheme will often produce more wins than losses. It's one reason why they had the No. 1 rushing defense in the NFL. Schwartz would typically like to rush four than blitz. Why not if you can generate pressure that way? The Eagles don't do anything special up front. Their most distinctive feature is the "wide-nine" ends. The ideal wide-nine end is explosive. Long won a Super Bowl with the Patriots last season, but he played out of position – on the right and mostly inside. He played most of his career on the left and as a 4-3 end. Long: For one, I probably weigh 263 pounds, so being inside is not really my strength. You lose a lot of things as you get older, but I still feel quick and I still feel explosive and I know how to rush because I've been doing it a long time. Rushing from the nine-technique forces tackles to get deeper into their vertical steps. 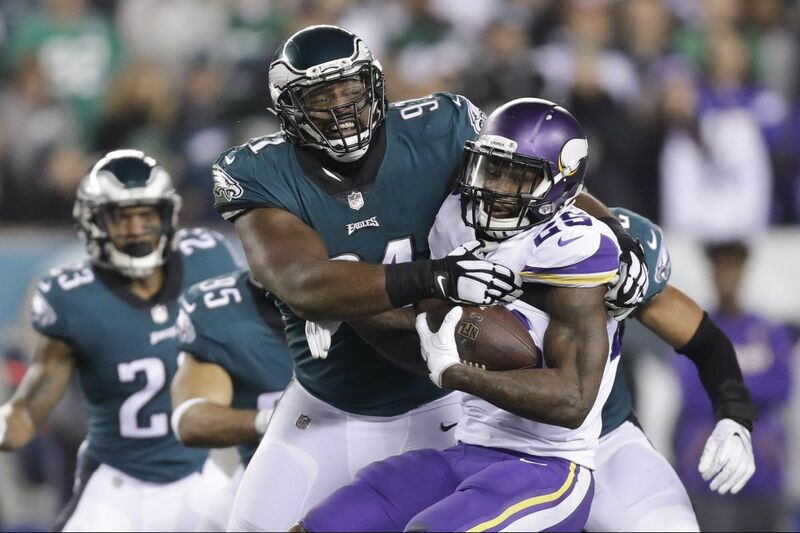 An elite tackle like Jason Peters will often just block the end beyond and past the quarterback. But if you're not quick enough, you can get burned as Vikings tackle Rashod Hill did here when Long got around him and forced Patrick Robinson's game-changing pick six. Outside rushes from the wide-nine are most effective in third and long when quarterbacks usually take deeper drops. The edge rush can also set up a counter inside move if the tackle continues to overset – as Curry showed here. The inside rushers, particularly Cox, have free reign to shoot the gaps. On the above play, he rushes from the three-technique. With defensive end Brandon Graham increasingly rushing from inside this season, offensive lines must pick their poison as to who to double. But defensive tackles Tim Jernigan and Beau Allen can be hard to handle, as well. Patriots center David Andrews: It's going to be a big challenge when new guys are rotating in like that and I think as an o-lineman you can't just be like 'Oh, I'm blocking this guy.' You need to be familiar with all the guys. Belichick: Cox is as good as anybody in the league at his position. He's a very disruptive player, hard to block, run, pass, no matter what it is. Cox: It's a lot of respect from a coach like Belichick, man, a guy that's been around, a guy that's seen a lot of great players in this league. For him to say that, that means obviously I must be something right, but at the same time I got three other guys beside me. Still, Cox is the cog. He's nearly impossible to block one on one. Cox: You kind of know when teams are going to scheme up to block you or game plan to slow you down. You know that early going into the game, but when you get in the game, you just got to get into a flow. You got to know how they're going to attack you. Cox said that he often compares notes with Buccaneers defensive tackle Gerald McCoy. Cox: If he played that team, I'll go back and watch how they schemed up and blocked him. Cox: Coach always says fight one person. If you fight one you're good, you fight two you're [screwed]. Patriots guard Joe Thuney: He's an elite player. He has the rare combination of great power, great strength, and is very quick and fast and athletic. If doubling Cox works, offenses still must contend with ends who can consistently win one on ones. Belichick: They have good edge rush and they come hard every play. These guys really play hard. There's no plays off, so you're going to have to block them on every play. You can't get away from them. There's nowhere to go. No scheme is perfect, though. It's impossible to cover the entire field. If the ends are wide, there will be additional interior space. And if an offensive line gets good push, and a second-level linebacker is out of his gap, there should be running room. There are also ways to take advantage of attacking fronts. Misdirection fakes, screens, play-action and draws, for example, can take the edge off a penetrating front. Long: We play hard and guys rally to the football and our back-end tackles well. Screens are a part of every offense and we know it. … But we're not the type of group that just runs up the field. The Eagles often keep the damage to a minimum. They have instinctive and athletic defenders that, for the most part, tackle well in space. This counter play had potential to gain big yards, but Kendricks read the fake, fended off the blocker and made a great stop. Belichick: When you run them they don't look as good as what you think they're going to look like – draws, screens, things like that, play action. A lot of times they blow those plays up, too. For the Eagles, the positives far outweigh the potential negatives, because their aggressive defenders generally produce negative-yard plays if they feel the need to go, like Graham did here. The other most common way to counter the attack is to simply get the ball out quick. On this dump, the ball – from snap to release — was out in 1.8 seconds. There isn't a defensive lineman in the world who can get to the quarterback in that amount of time. Jenkins slipped on the above play, but the Eagles' back seven will need to tackle well. Their cornerbacks will need to either press or make plays on the ball when in off coverage, as Darby did here. Brady is as quick and accurate as they come and the d-line must remain patient. Curry: At the end of the day, you just got to stay with it. We know what kind of matchup we have ahead of us. Cox: What makes them so unique is [Brady] gets rid of the ball fast. He's not going to take a lot of hits. He knows where he's going when the ball is snapped. … It's going to come down to the front four guys, getting after the quarterback, making him uncomfortable in the pocket.